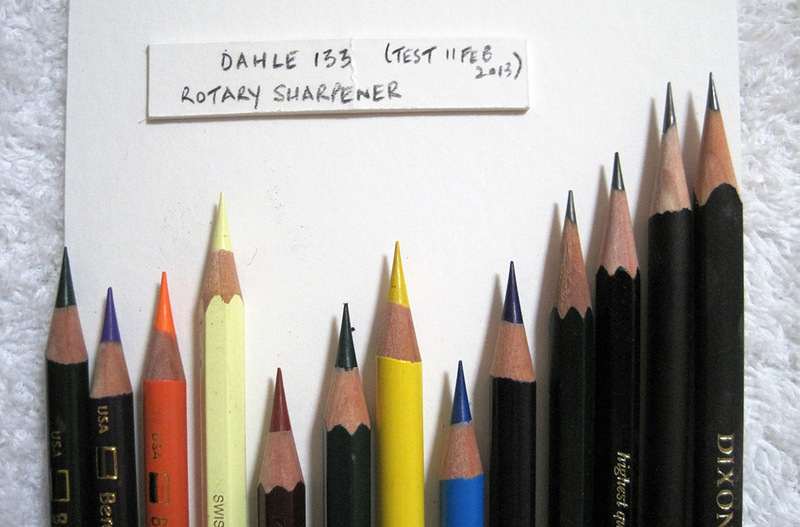 Recently I purchased the Dahle 133 rotary sharpener from Amazon UK. I wasn’t expecting a great sharpener given it’s bland looks in dull grey and black. There were however some features that drew my attention to this sharpener. The protected grippers that do not mark the pencil, unlike the usual metal “jaws of death” seen on most rotary sharpeners. The sharpener is advertised as having 2 point settings – sharp or blunt, however the screw type mechanism seems to allow for an infinitely variable sharpness between these two extremes. Low cost, from 7-10 pounds sterling depending on colour. I didn’t realise Amazon were also offering a green and white and black and white model for a couple of pounds less than my model. Sharpens pencils from the usual standard around 7mm up to 11.5mm for some chunky art pencils. As my main interest is graphite pencils, I sharpened a selection to see if it produced a point comparable to my gold standard sharpener – a modified (with padded grippers from the premium model) Carl Angel 5 (chinese mechanism). Here’s the results. Standard diameter hex pencils such as the Faber Castell 9000 and Tombow Mono 100 produced a short exposed core and a dull point. Not impressed. The round barrel Papermate Black Warrior (Mexico) produced a nice long cone and good point sharpness. The oversize triangular Dixon TRI-CONDEROGA sharpened nicely with a long cone and medium/long exposed core. While not as good as a Carl Angel-5 it does have the advantage of padded grippers and the ability to sharpen oversize pencils. I would give it a 6 1/2 out of ten for graphite pencils. BUT, and here’s the big BUT, this sharpener is absolutely brilliant with all the coloured pencils I tested. It seems the thicker cores of coloured pencils – 3mm and up are better suited to the geometry of the mechanism than thinner cored graphite pencils. – the overall cone (wood and core is long and nicely tapered) and the exposed core is almost razor sharp and with just the right length. 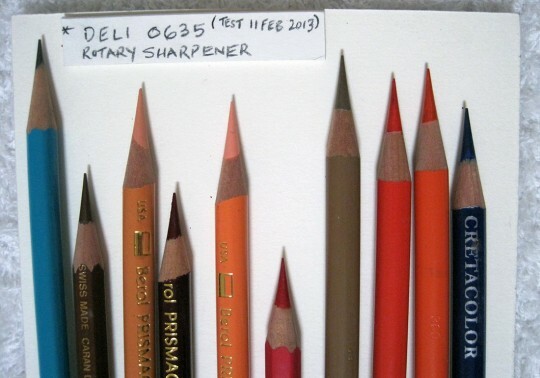 For comparison I sharpened a graphite pencil and more coloured pencils in one of Matthias’ favourite sharpeners – the Deli 0635. The result for the graphite Berol Turquoise was quite good but the point and cone shape/length not up to the standard of the Carl Angel 5. But, yet again the coloured pencils were sharpened to an almost absurdly l.o.o.o.ng cone length and the exposed core is also massively long and deadly sharp, even sharper if that’s possible, than the Dahle 133. 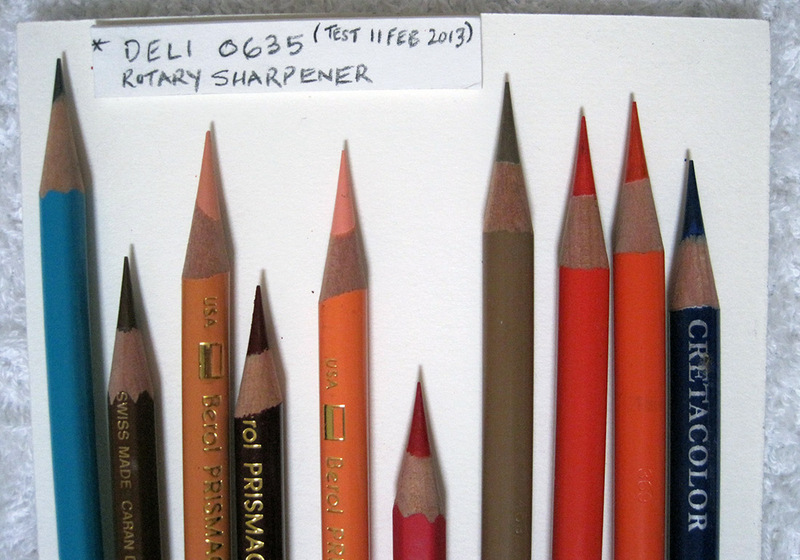 Of the two sharpeners I would plump for the Dahle 133 for the more reasonable length of the cone and the exposed core. The Deli 0635 cone is simply freakishly long and sharp and thus the point strength is compromised. Both these sharpeners would fit easily in most outdoor art sketching kits. The Deli 0635 is super compact and the Dahle is compact – about half way between the Carl and the Deli in size. Both these little sharpeners are basically plastic externally but have robust all metal cutting cylinders with all metal gear drive. The padded grippers on both sharpeners was the main reason I purchased them and in this regard they do their job admirably. I only wish that manufacturers and sellers would promote these padded gripper models as a feature – which they certainly are. Given the results with coloured pencils, I will certainly be using mine more often in future. Thanks to Matthias for the airing of this guest review. You can find another review of the Dahle 133 at Lexikaliker (Google translation of the blog post).